Oh, that wacky Duggar family. Not content to rest on her laurels after giving birth to her 18th child less than a year ago, Michelle Duggar is at it again. 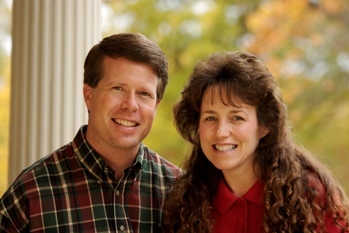 That’s right, Jim Bob and Michelle Duggar are expecting their 19th child. I guess once the oldest one moved out of the compound with a wife of his own, they had a bed to fill and a reality show to film. I can only imagine what sort of J-themed name they’ll give their newest child. I mean, they already have 18 other kids with J names, plus the family dog is named Jazmine. Jim Bob Jr. is still available! Or just Junior! That has a great ring to it! Most people would tell the Duggars to stop having children. Not me. Do you know why? Because unlike Jon and Kate, Octomom, and all the other families with reality shows (or who want to have reality shows) that have entirely too many children, the Duggars did it the old fashioned way. No hormone treatments, no pills, no scientific intervention, just good old-fashioned procreation. Yeah, it’s kind of crazy, but at least it’s honest.